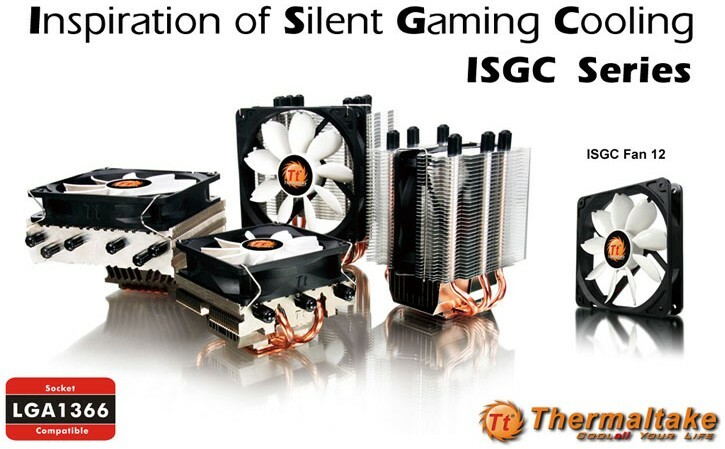 Mar, 2009 – Thermaltake is proud to unveil an array of silent and attractive CPU coolers – ISGC Series today. ISGC series includes 4 models, ISGC-100, ISGC-200, ISGC-300 and ISGC-400. ISGC-100/ 200 are designed for the mainstream users while ISGC-300/ 400 are aiming for the high end users to support the latest Intel Core i7 CPU. Top with the features from ISGC Fan 12, ISGC coolers also bring silence to the users. The Hydro Dynamic Bearing (H.D.B) not only extends the product life; it also reduces the noise level. Special designed fan blade is to optimize the air flow and thus noise can be decreased to the minimal level. With these smart concepts, the coolers are bringing sufficient cooling to the CPUs while the environment can still remain silent and comfortable. For ISGC coolers, your choice will depend on your needs. ISGC-100 and ISGC-200 are equipped with 9cm PWM fan to automatically adjust the fan speed according to the CPU temperature; ISGC-300 and ISGC-400 feature with 12cm speed controlled fan for users to adjust the fan speed according to their needs. The ISGC coolers will be fully satisfactory as never before; Enjoy your PC system reaching a new high performance level with Thermaltake ISGC series now!